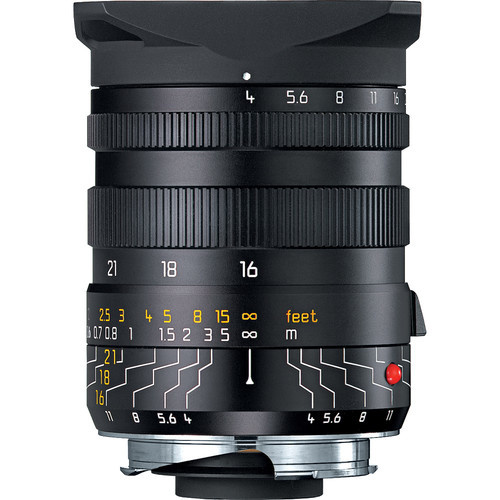 Configured for ultra-wide photography with an M-mount rangefinder camera, the Tri-Elmar-M 16-18-21mm f/4 ASPH. 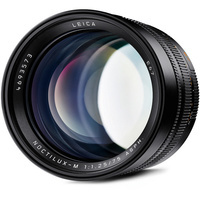 Lens with Universal Wide-Angle Viewfinder from Leica bundles the uniquely versatile three-focal-length lens with the Universal Wide Angle Viewfinder for making more accurate compositions with each focal length position. 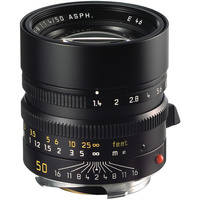 A uniquely versatile super-wide lens, the Tri-Elmar-M 16-18-21mm f/4 ASPH. 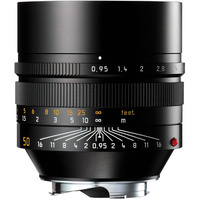 from Leica allows you to work with three separate focal lengths within one lens. The optical design, which includes a pair of aspherical elements, notably reduces distortion for clean, accurate rendering of interior and architectural subjects, and the aspherical elements also promote a more compact form factor. 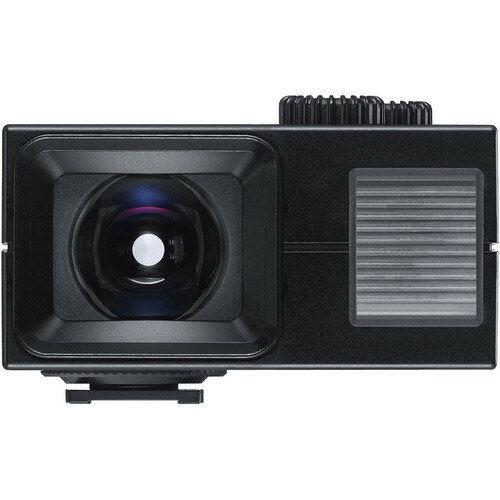 Seamless switching between 16mm, 18mm, and 21mm focal length positions is possible while retaining a minimum focusing distance of 1.6', and a floating elements design is used to maintain image quality even at close range. Unique three-focal-length lens gives you the option to seamlessly switch between the 16mm, 18mm, and 21mm focal length positions to adjust your field of view. Super wide-angle lens has been designed to notably reduce distortion and field curvature to suit photographing interior and architectural subjects. Two aspherical elements are featured to limit spherical aberrations and improve sharpness and clarity throughout the aperture range and at each focal length setting. 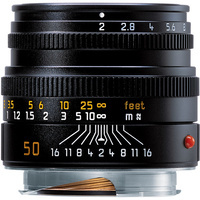 An internal manual focusing design is used along with a floating elements system to achieve consistent image quality throughout the focusing range at each focal length, even at the minimum focusing distance of 1.6'. The aspherical elements also contribute to a more compact form factor. 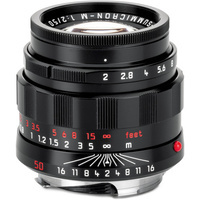 The front of the lens is male threaded to accept the included lens hood or an optional 67mm filter holder. 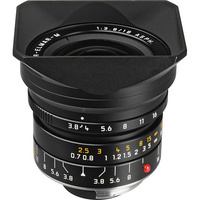 The Leica Universal Wide-Angle Viewfinder M is a shoe-mounted external viewfinder for M-system rangefinder cameras (including M8). 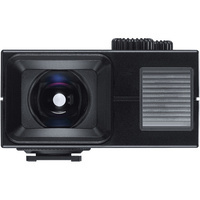 This viewfinder offers bright-line frames to match the 16-18-21mm lens. 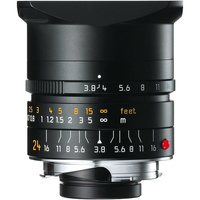 Since the 1.33x conversion factor has to be considered for the M8 digital camera, bright-lines for 21, 24, and 28mm are also included. 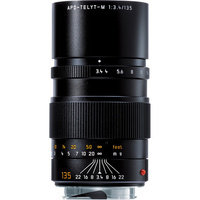 It can also be used with other fixed lenses that match this range. A parallax compensation dial allows for adjustment of the frame to the focusing distance, in five steps (0.5, 0.7, 1, 2 meter & infinity). The use of one aspherical lens element and one with achromatic correction in the viewfinder makes it insensitive to stray light, and provides a high resolution and exceptional brilliance image. An illuminated spirit level helps to keep the camera horizontal even in unfavorable light conditions. Compatible with the R8/R9 series of diopter correction lenses.